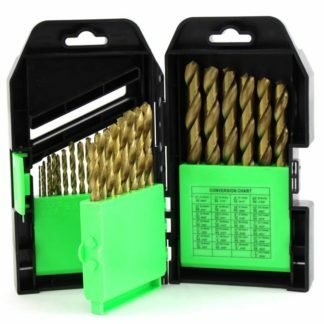 35150 GRIP 29 pc HSS Titanium Drill Bit Set Sizes: 1/16" to 1/2" by 64ths Description 29 pc Titanium HSS Drill bit set HSS4241, roll forged with titanium coated. 118 degree point tips can drill into all types of materials including: wood, metal, drywall, particle board, and more. High speed steel with titanium nitrate coating drill smoother and run cooler. Heavy duty plastic case with identified slots for each bit. SIZES : 1/16″, 5/64″, 3/32″, 7/64″, 1/8″, 9/64″, 5/32″, 11/64″, 3/16″, 13/64″, 7/32″, 15/64″, 1/4″, 17/64″, 9/32″, 19/64″, 5/16″, 21/64″, 11/32″, 23/64″, 3/8″, 25/64″, 13/32″, 27/64″, 7/16″, 29/64″, 15/32″, 31/64″, 1/2“.